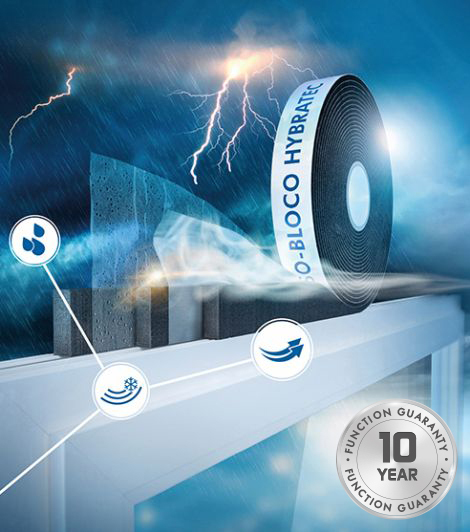 ISO-BLOCO HYBRATEC combines the quality features of premium window connection foils with the benefits of BG 1 and BG R-certified multi-functional joint sealing tapes. This new hybrid technology combines excellent impermeability to air and resistance to driving rain of foils with the considerable expansion force and significant long-term capacity to absorb movements of pre-compressed PUR soft foam. Isn’t that great? With an a-value of 0.00 m3/[h·m·(daPa)n], ISO-BLOCO HYBRATEC is 100% airtight on the inside, preventing heat losses by convection. In the functional area, the tape has high acoustic and thermal insulation values while, in the weather protection layer the resistance to driving rain (1,050 Pa) is greatly above-average. By integrating several barrier layers, ISO-BLOCO HYBRATEC conforms to the RAL principle of “inside tighter than outside”. Total air-tightness, maximum thermal protection and resistance to driving rain to take account of climate change, combined with long-term capacity to absorb movements ... these are mandatory requirements for passive and zero-energy houses. You're on the safe side with ISO-BLOCO HYBRATEC!